I started using Theradome, the wearable laser therapy for hair loss, just over four months ago. As I have previously mentioned, I was suffering from post-partum hair loss but was not actively seeking any treatment for it. When Sally-Ann discussed Theradome with me, I was willing to give it a try. I have now been wearing Theradome two times a week, 20 minutes each time, for the last 4 months. I am pleased to report that I have noticed remarkable changes in my hair over this time. See for yourself. Where there were significant bald patches towards the front of my head just a few months ago, I now have dense hair! When I say dense, please do not expect something as unrealistic as advertisements on TV. I am talking a sensible amount of hair, enough to give me the confidence to wear my hair any way I want. I no longer have to think about parting it a certain way or tying it a certain way, because there are no bald patches to cover up any more. By the way, the greys you see have nothing to do with Theradome. It is just me being lazy about touching up my roots. And proof that I have not tampered with the photographic evidence. It means Theradome works! 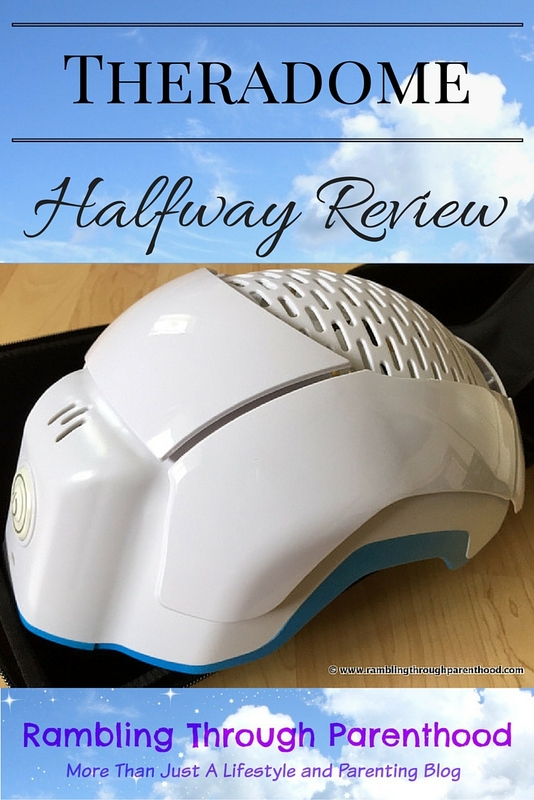 It is doing what it promised to do, which is reverse hair loss and help hair growth. I wasn’t sure it would when I started using it. Let’s be honest, I had never heard of it. Sally-Ann reassured me about its safety, allaying my concerns of using lasers on my head. She explained that these were surface lasers that would not penetrate beyond stimulating my hair follicles. I did the blood tests she recommended to check if there were any underlying deficiencies that were contributing to my hair loss. Turns out, all vitamins and hormone levels were normal. My blood iron levels were slightly low. Not enough to warrant a prescription of iron supplements, but low enough to cause hair loss. I have since started taking over-the-counter iron supplements (as opposed to the high-dose ones that Sally-Ann recommended. The gastric side-effects put me off taking them, I am afraid). Nothing else has changed in terms of lifestyle, food and exercise habits. I still notice clumps of hair falling in the shower and entangled in my hair-brush. And then I see the new hair growth and shrinking bald patches on my head, despite my erratic iron eating. I think that is evidence that Theradome is working to restore my hair. I plan to continue using Theradome for another four months, as advised, when I will report back on my hair. That will mark the end of the treatment course, and I will then be moving to maintenance therapy. I believe I have reason to be optimistic about the future of my hair. 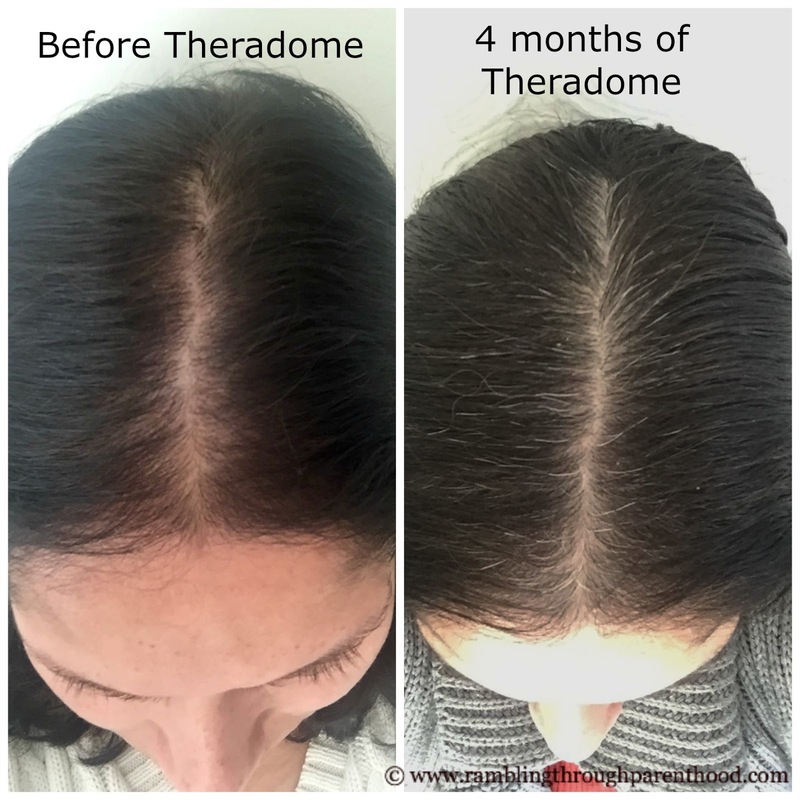 If you have concerns about your hair, why not get in touch with Sally-Ann about Theradome? She is a qualified trichologist and can help with your hair problems. Disclosure: I have been given a 'as new' Theradome helmet in return for writing about my experiences using it. All opinions are my own. That's impressive to see a difference. I had thought most treatments had quite a limited success rate until you started looking at transplants so how great you've found one that works for you. You can really see the difference and that is amazing. It looks thicker. I can see that Theradome has worked and restored some of your hair back. That is fantastic that it does what it says. Oh wow amazing ... i love the difference... your hairs have been quite thick ..
Absolute evident improvement and boy do I need this in my life!! I think hair transplant is permanent solution for hair loss because byt his any one can regrowth their hairs naturally. I beg to differ, Riti. Hair transplant is not a natural way to regrow hair. It is a surgical transplant procedure (as the name suggests).